As an undergraduate student, I was supposed to study abroad in Florence. My application to a program was accepted, my passport was at hand, and it seemed like the only thing left to do was pack my bags.Worrying about "accessible travel" was furthest from my mind as I considered the experiences ahead. A few months before I was scheduled to leave, I disclosed to the program that I had cerebral palsy and used an electric wheelchair to get around. This was a larger issue than I expected, partly due to the program's inexperience in dealing with a student with a disability and partly due to the overall inaccessibility of the city. Faced with so much opposition, I decided not to go. For months after, I wondered about how citizens with disabilities in Western Europe dealt with things like accessible travel in their lives. Eventually, Iwas awarded a grant to go to Europe and make a documentary about accessibility in the region. In January 2012, a crew member and I went to four different Western European countries-Ireland, Belgium, France, and Italy-in three weeks. We encountered some obstacles. But none of them proved to be insurmountable. Here's the takeaway: If a college kid and a friend can travel across Europe in just three weeks with $10,000 worth of equipment and a film to shoot, there should be nothing stopping you from living your dream escapade or returning to the site of a cherished memory. The biggest concern for me as a wheelchair-user was transportation-both getting to Europe and traveling within Europe. Although it should be second nature for you to notify the airline that you will be bringing a wheelchair, make sure to let them know what type of battery it has (if it's electric), and be as specific as possible when advising them on how to properly store it. My wheelchair was broken by the airlines toward the beginning of my trip. While I'm not sure how I could have prevented the incident, being as elaborate as possible on safe storage (they'll probably check it because it won't fit in the cabin) is crucial, especially because it will be easier to prove airline neglect if you get a broken wheelchair at your destination. 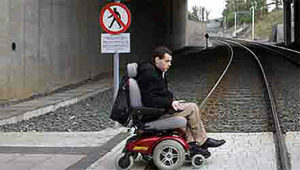 In terms of accessible travelaround metropolitan Europe, accessible transportation is available but requires some patience. If you call for an accessible cab, the fare starts as soon as you get off the phone, so be prepared to shell out a few extra euros. Metros are usually accessible but may require a worker to bring out a manual ramp to avoid the gap. Most buses seem to be accessible. Call AND Google Map every hotel, restaurant, and public place you plan on going to in order to figure out its accessibility. You can be spontaneous with nightlife, but the more research you do before traveling, the better. Locate wheelchair rental and repair places before you go out in case anything happens. Buy the right CONVERTER to charge your wheelchair. Unlike adapters, converters will change the voltage of the outlet so you don't blow your battery up. You need to research the right voltage for your chair. Learn key words if you aren't already familiar withthe language: words like "ramp," "lift/elevator," "wheelchair," and "accessible." "Straw"was a big one for me, especially with all the vino in Italy! Be prepared for different social attitudes towards people with disabilities-some more progressive, others less so. When planning your trip, contact travel agencies that specialize in holidays for people who use wheelchairs. Living with a disability demands creativity. For accessible travelabroad, that creativity and your patience might be put to the test at times. However, those moments will most likely pass, and you will realize not only what you have accomplished by embarking on this journey, but also how it was all well worth it. No trip is ever perfect. But making the best of something doesn't come down to circumstance or access, but rather a state of mind. Reid Davenport is an award-winning documentarian who makes films about people whose lives speak to broader issues. His films have been shown across the country and around the world, and have gained prominent media attention from NPR, BBC, and the Washington Post. He is currently pursuing his Master of Fine Arts in Documentary Film and Video at Stanford University.